Oh the first weeks of January…such a unique opportunity for renewal in any way that I choose after careful contemplation and reflection upon the last 365 days of my life! I try to examine my life in categories: physical health/choices, emotional & mental status, and of course, my spiritual life. Admittedly, my first inclination was to consider mostly my physical health with ideas on how the next 365 days will be decidedly better. 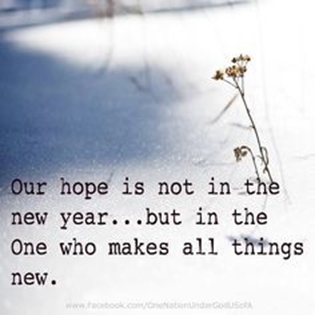 I saw a quote recently while scrolling through many ‘Happy 2019’ messages on social media that said, “Our hope is not in the new year, but in the One who makes all things new”. I repeated it slowly and deliberately to myself a few times; it moved me in a special way. It is not by our own volition that we re-invent ourselves but in the recognition that Jesus alone can make us ‘new’. How did I decide to live this out? I went to the sacrament of reconciliation and was ‘made new’ by the Lord the first week of January. This affirmed my resolve to put my hope in Jesus and not in my own waning willpower (that will most likely waver in a relatively short amount of time). The mercy of the Lord will never waver. What a beautiful gift we have in Him. What is one way that you can truly put your hope in the One who makes all things new?